My research for a client has provided some interesting information about million dollar homes in Tallahassee. 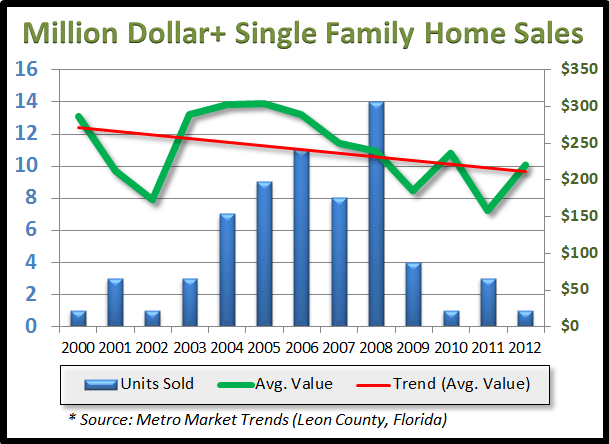 Long time readers of the Tallahassee Real Estate Blog know that we monitor supply and demand at all price points, so I was not expecting any great surprises when I put million dollar homes in Tallahassee under the microscope. While nothing was shocking, the information was truly enlightening. If you plan on buying and thus viewing million dollar homes in Tallahassee, expect to travel in a small and declining crowd. I decided to go beyond the Tallahassee MLS and look at the entire tax records for homes that sold above $1M since 2000. The graph above shows the results. I eliminated large "land deals" that included small homes, I was mostly looking for homes on parcels of 10 acres or less. In the real estate graph above, the blue bars measure the number of sales each year, while the green line measures the value in price per square foot of heated and cooled space. While this is no way to evaluate a specific home, it is a fair way to establish the movement in the market of million dollar homes in Tallahassee. No big surprise, values are dropping for the luxury homes, just as they are for everybody else. The enlightenment that this research provided me was the significance of the housing boom. Looking at the blue bars in graph above, we observe 1 to 3 million dollar homes in Tallahassee being sold each year before and after the boom. But during the boom years of 2004 to 2009, there were nearly 9 homes sold each year! That could have significant ramifications for luxury home owners for many, many years to come. Once this has been complete, I think people who own million dollar homes in Tallahassee will have the information they need to make a better decision when it comes to deciding to sell and how they will price their homes. Until then, if you want to know more about million dollar homes in Tallahassee, just drop me a note and we can schedule some time to figure things out.